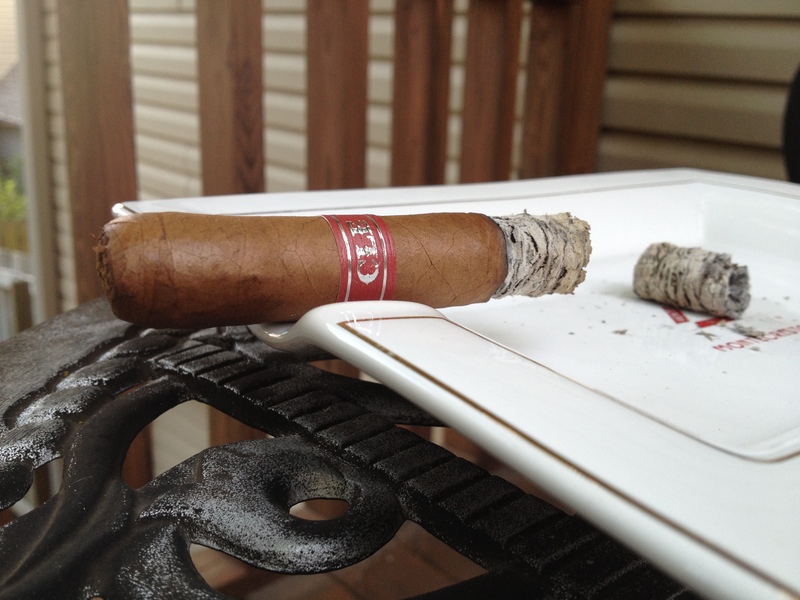 I enjoyed the Cuarenta (Spanish for 40, named in honor of Christian Eiroa’s, the owner’s, 40th birthday) outside on my back deck. It was a little windy, but near-perfect temperature on a bright, sunny day. I paired this cigar with Boulevard Wheat Beer with a lemon which I wouldn’t normally do because those strong flavors can effect the flavors that you pick up in a cigar, but it was too gorgeous of a day not to enjoy a Boulevard Wheat on a gorgeous, atypical-not-blazing-hot-as-is-normally-the-case summer day in the South. 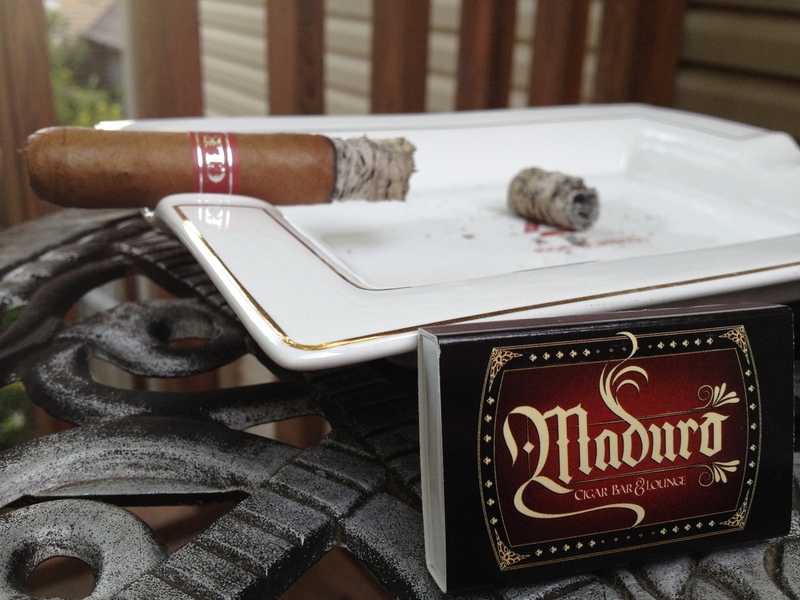 Tobaccos – the wrapper is Habano and the binder and filler are Honduran blends of tobacco. I purchased this cigar at Maduro Cigar Bar & Lounge in downtown Little Rock, Arkansas. If you’re ever in the central Arkansas vicinity let me know, because I’d love to show you around this jewel of a cigar bar. It has a great selection of drinks (beer, liquor, unique cocktails, pop (I’m from Kansas originally and we call it pop and they also have some finger foods to snack on. 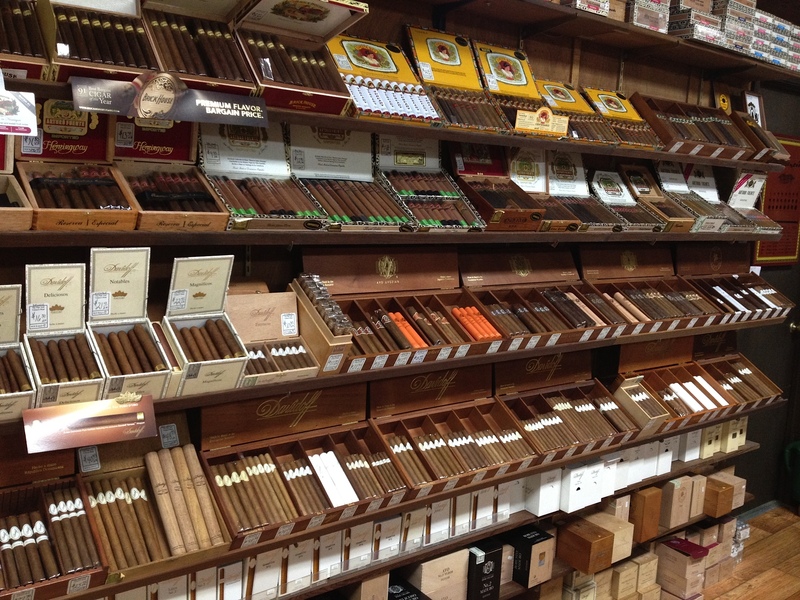 Oh, and their cigar selection is excellent as well – they primarily carry boutique cigar brands – My Father’s Cigars, Tatuaje, Padilla, Perdomo, Espinosa, Alec Bradley, and many more. I highly recommend visiting Maduro for your next cigar. 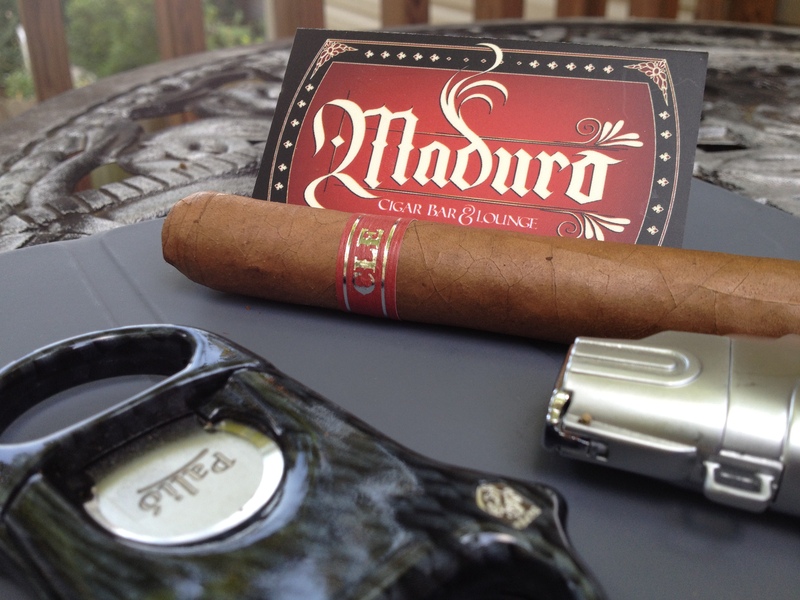 The Cuarenta is an extremely good looking cigar. The wrapper has a dark caramel color that to me looks great with the maroon wrapper. 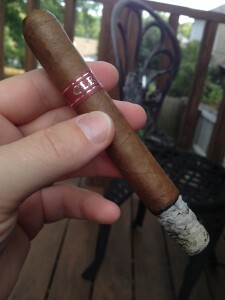 I will never claim to be a style aficionado, that is Joel’s specialty, but I will tell you what I think looks good in a cigar, and this looked good together. The Cuarenta had a triple cap that when cut came off evenly and cleanly just below the first (top) cap. The cigar itself was relatively firm but not hard as a rock. It also had visible veins and invisible seams. 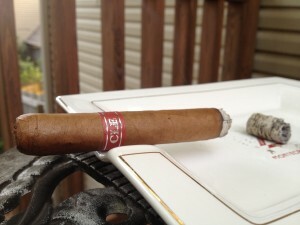 It is a great looking cigar. 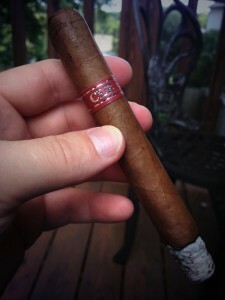 On the cold draw (cut, but unlit cigar) I picked up flavors of cocoa, milk chocolate, and roasted, mixed nuts, which is interesting because as you’ll read in this review cocoa and milk chocolate flavors weren’t detected when it was lit, but hey, no pasa nada. 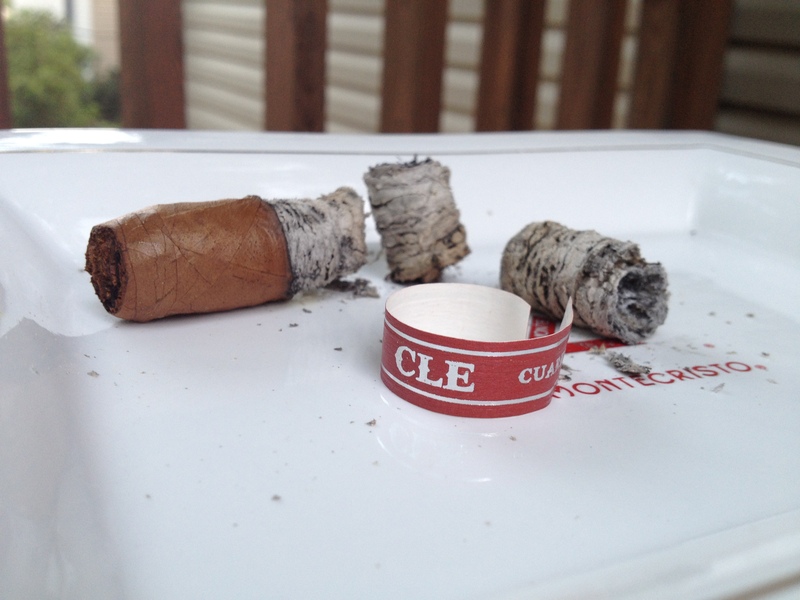 The draw was nearly perfect – it had just enough of a resistance to enjoy the pull off of the cigar. 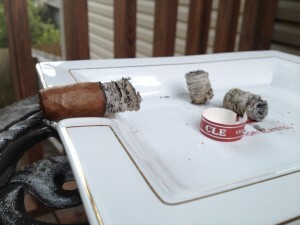 The burn on the Cuarenta was excellent. 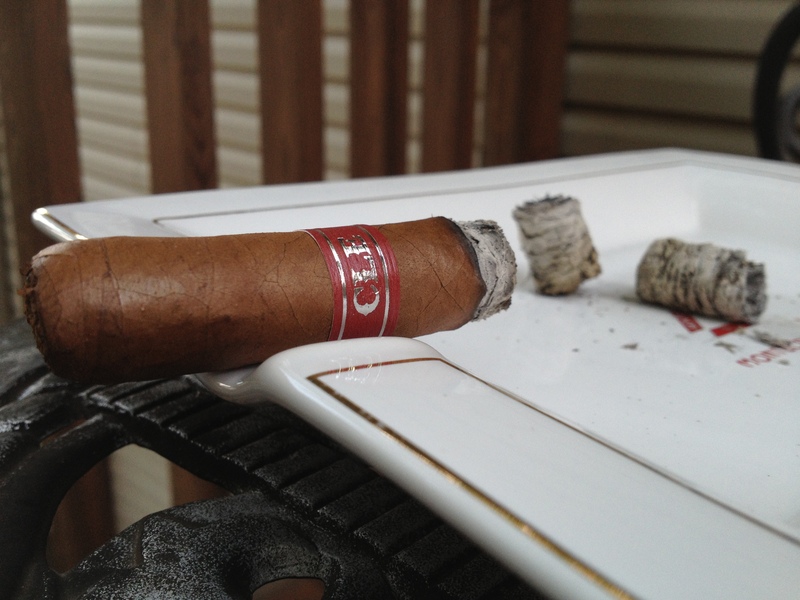 Even though it was a bit windy and except for at the beginning when I made the mistake of lighting the Cuarenta with my double jet lighter. Since this vitola is not a large ring gauge using the double jet lighter caused the initial burn to be a little wonky because one of the flames crept up the side of the cigar. 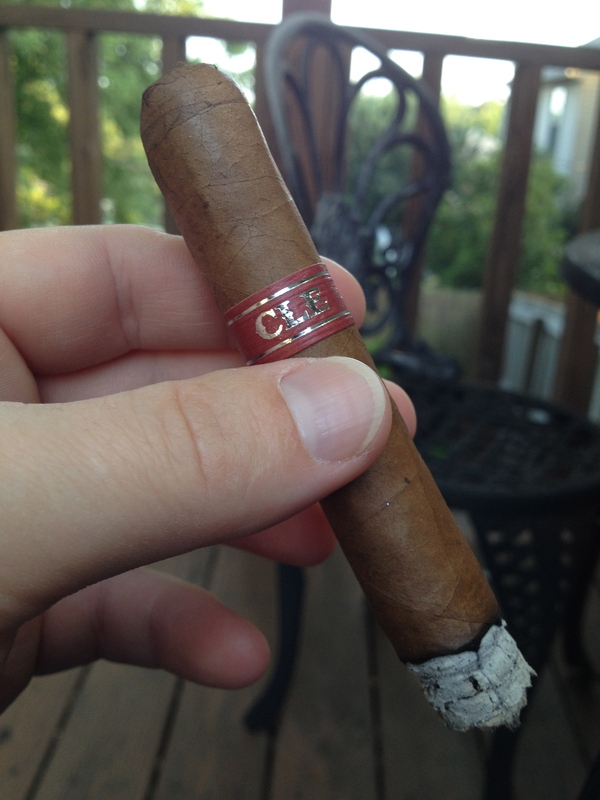 But thankfully the cigar quickly corrected my mistake by evening itself out and from then on the burn stayed razor sharp throughout the entire smoke. Each time I would ash it would hold on to about 1” to 1.5” inches (only one exception) and would fall off in whole clumps. At first light the immediate wash of flavors was wet leather (don’t ask me how I know what that tastes like) with a bit of wet cedar, with a spicy finish. Once the cigar settled into the first-third the prominent flavors were wet leather, wet cedar (woody), and a hint of cashew on the back end. The ash was whitish-grey and although it looked a little loose it held on for 1.5 inches. The second third brought a bit of a flavor change but not a huge complexity change. The prominent flavors in this third were roasted nuts, a little leather, hints of carmel and a bit of black pepper at the back of the throat. The finish was relatively short and left a little bit of a nutty flavor on the palate. The second ash fell off at only another .75 inches, but I’ll attribute that to the wind – I was enjoying this on my deck in my backyard. The final-third stayed pretty much the same as the second-third but had a little sweeter finish. Flavors consisted of wet leather, and nuttiness. The finish was a short, crisp, clean and sweet finish. 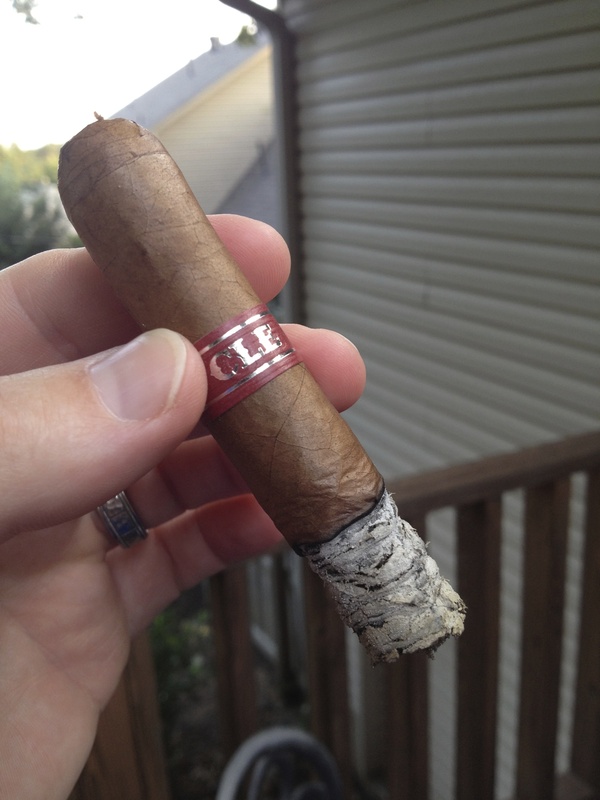 This cigar was highly enjoyable and it hit on some of my favorite flavors…although I do have several flavors and flavor combinations that I consider my favorites. Mild to medium, a little closer to medium. Normally I try to avoid categorizing “things” in my life, because most things in life don’t fit neatly into rigidly defined categories. Take for instance the duck-billed platypus; this animal has intrigued me my entire life, but I mean, come on, what type of animal is it? It has a duck’s beak, a tail like a beaver, it has venom, and ankle spurs like on my University’s mascot the Jayhawk. And is it a bird or a mammal? It lays eggs, but it is still classified as a mammal…talk about blurring the lines between classifications. I digress…where was I? Oh yeah…sometimes I like to bifurcate cigar descriptors as either a “golf cigar” or a “session cigar”. As a disclaimer there are often-times a cigar might not fit neatly into one of these categories…but it’s a fun game to play. A golf cigar is one I would take to play a round of golf – the cigar needs to be long lasting (I’ll normally take two cigars with me and have each cigar last the majority of 9 holes). Being that I’m playing golf and normally having to focus on how far out of bounds my ball landed I want the cigar to be a good flavor but I don’t want to pay a premium price for flavors I might miss. 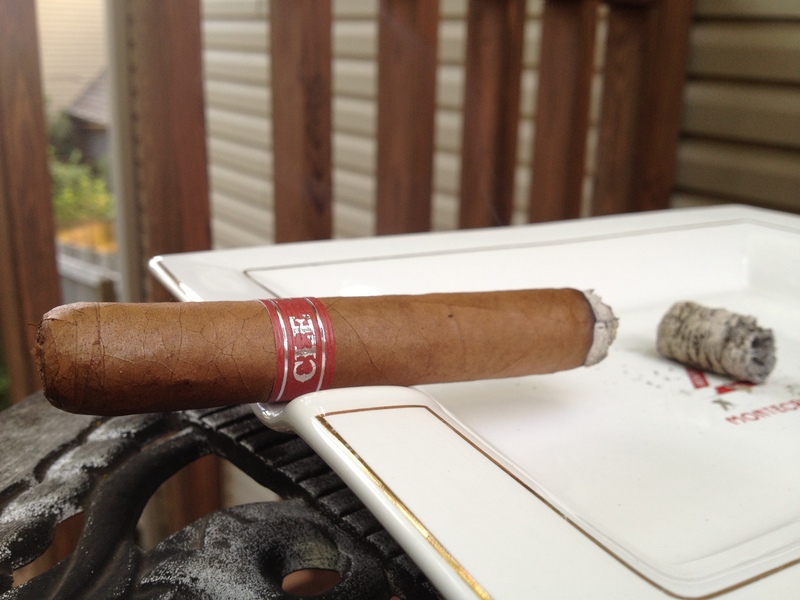 A session cigar is a cigar I’m sitting down to enjoy, and giving it my full attention. I want to notice the flavors, the burn, the draw, the complexity, and how it pairs with drinks. 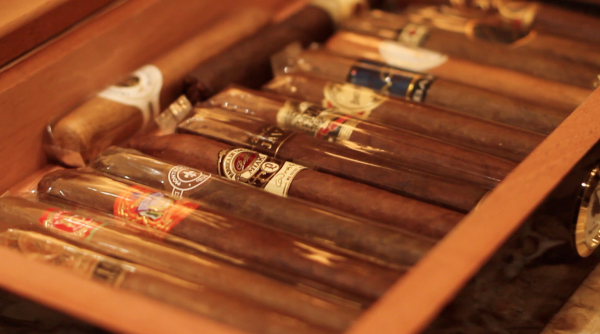 The length of time the cigar lasts is not a factor for a session cigar – it’s all about the quality of the cigar. I’ll normally pay more for a “session cigar” than I will for a “golf cigar”. 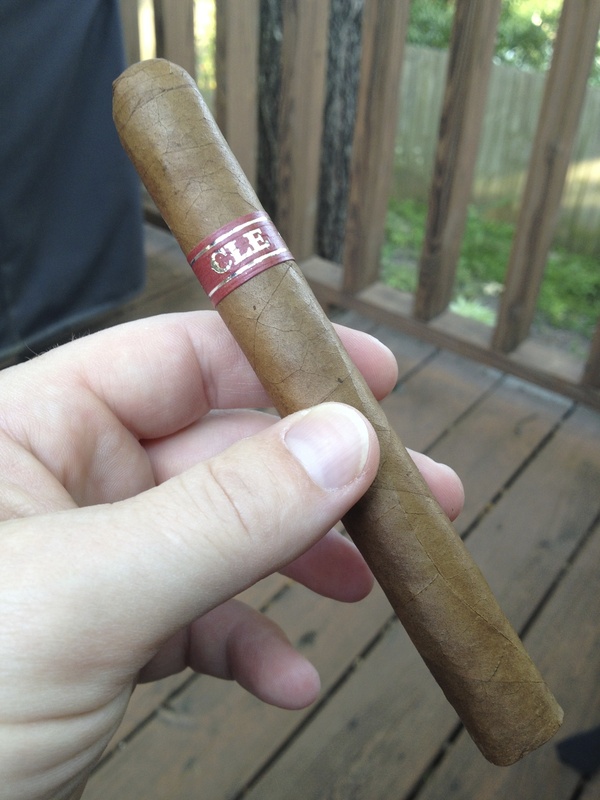 The CLE Cuarenta would fall into the “session cigar” category. 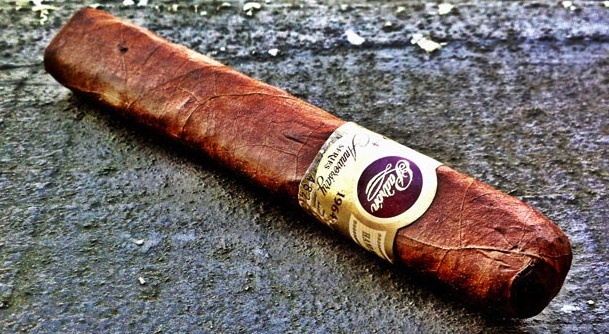 It’s too short (length of time) and too flavorful to be a golf cigar. You need to sit down and relax to truly enjoy the flavors of this cigar. I enjoyed a Boulevard Unfiltered Wheat beer with the Cuarenta but I would think a nice scotch or bourbon would pair well with it as well. Would I smoke this cigar again? – Absolutely. I’ve actually smoked this cigar quite a few times and will continue to have this in my regular rotation. It’s an excellent cigar.